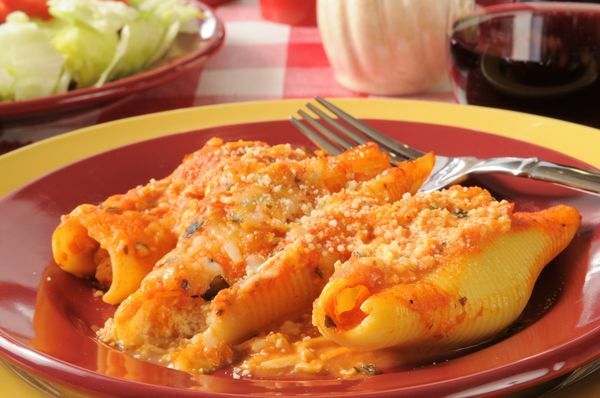 Some Of The Best Classic Stuffed Shells That We’ve Ever Tried! And They’re So Simple! Spinach and ricotta are the perfect pairing- especially when they are tucked inside a big pasta shell and smothered in marinara. Pair the masterpiece that is stuffed shells with a nice salad and some garlic bread, and you’ll have yourself a winner at the dinner table. There are tons of variations on this classic suppertime dish, shells come stuffed with everything from a medley of cheeses to Italian sausage to ground turkey. We’ve even seen bolder recipes for enchilada stuffed shells packed with refried beans and enchilada sauce. For this recipe, we’ll keep it classic with spinach and three kinds of cheese: ricotta, mozzarella, and Parmesan. If you’d like to add ground turkey or ground beef, be sure to cook the meat before adding it to the stuffed shell mixture. One pound of meat would be perfect for this recipe.